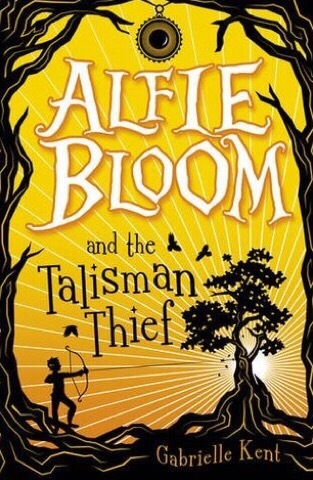 Alfie Bloom and the Talisman Thief is the sequel to Alfie Bloom and the Secrets of Hexbridge Castle (hereinafter referred to as SHC) which I reviewed back in July. I thoroughly enjoyed SHC, especially the humour and the pacy smart writing, but TT surpasses it in every way imaginable. SHC had the burden of the setup, with Alfie being inducted into a previously unknown world of magic and druids and time travel, but TT already has all that setup done for it, so can relax and spread its storytelling wings. What TT reminded me most of all is a really good Doctor Who “base under siege” story. There are even some really clever bits of temporal paradox thrown into the resolution (none of which I can mention here without spoiling the surprise!) that made me grin when their secrets were revealed. There’s more fun with Artan the bear/flying carpet, intriguing revelations about Ashford, and a lot of the minor characters get more time in the spotlight. Despite all the revelations, there are still intriguing hints about more secrets to be unveiled. I don’t think Alfie is going to run out of adventures any time soon – which is fantastic news. Roll on the next in the series!